MADRID (AP) — Zinedine Zidane’s honeymoon period didn’t last long in his return as Real Madrid coach. In his third game back in charge, Real Madrid’s familiar struggles returned in a 2-1 loss at Valencia in the Spanish league on Wednesday, reigniting criticism against the Spanish powerhouse. Madrid had beaten Celta Vigo and Huesca in its first two matches since re-hiring Zidane, who quit nine months ago after leading the club to three straight Champions League titles. Goncalo Guedes and Ezequiel Garay scored in each half for Valencia at Mestalla Stadium, before Karim Benzema pulled one back for Madrid in second-half injury time. 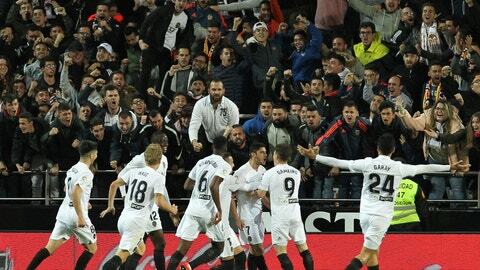 The result extended Valencia’s unbeaten streak to 12 league matches and moved the team to fifth place in the standings, one point behind Getafe in the final Champions League spot. Valencia had a dismal start to the season but hasn’t lost in 17 consecutive matches in all competitions. Madrid is now five points behind second-place Atletico Madrid, which defeated Girona 2-0 at home on Tuesday to move within eight points of leader Barcelona. The Catalan club scored a couple of late goals in a 4-4 draw at Villarreal. Barcelona hosts Atletico on Saturday. Madrid controlled possession from the start but it was Valencia that threatened the most on counterattacks. Guedes opened the scoring with a right-foot shot from inside the area in the 35th minute and Garay sealed the victory with a header in the 83rd for his second goal of the season, with the other coming in the team’s 1-1 home draw against Barcelona. Athletic Bilbao relinquished a two-goal lead but salvaged a 3-2 home victory with a controversial penalty kick converted by Iker Muniain three minutes into injury time. Levante evened the match with two second-half goals, including one in the 89th minute, but the hosts recovered after Muniain was fouled inside the area and scored from the spot. It was the third win in a row for Athletic, which is eighth in the standings. Levante, winless in six matches, stayed 15th. Celta Vigo also relinquished a two-goal lead in its match at last-place Huesca, allowing the hosts to rally and take a 3-2 lead before netting an 81st-minute equalizer to salvage a point. A victory would have been enough to move Celta out of the relegation zone, but it ended one point from safety. Second-to-last Rayo Vallecano, five points behind Celta and one point in front of Huesca, lost 2-1 at midtable Eibar.